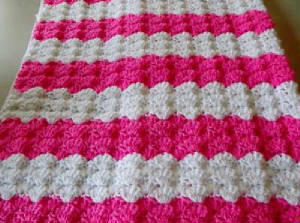 This free crochet baby afghan can be crocheted quickly with a J hook. 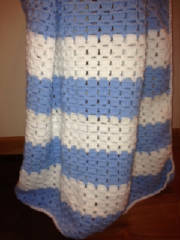 Change the colors to blue for a baby boy. 2 1/2 shells and 2 sc = 4"
Note: Work in ends as you go. Row 1: 2 dc in fourth ch from hook. ( 3 skipped chs count as first dc) Skip next 2 chs, sc in the next ch. *Skip next 2 chs, 5 dc in next ch, skip next 2 chs, sc in next ch. Repeat from across. Row 2: Ch 3 (counts as first dc, plus turning ch now and throughout work). Turn. 2 dc in first sc, skip next 2 dc, sc in next dc, *skip next 2 dc, 5 dc in next sc, skip the next 2 dc, sc in next dc, Repeat from *across. Row 3-6: Repeat Row 2. At end of row 6, end off pink and join white. Row 7-11: With white, repeat row 2. At end of row 11, end off white and join pink. Row 12-16: With pink, repeat row 2. At end of row 16, end off pink and join white. Rows 17-61: Repeat rows 7-16 until there are a total of 6 white stripes and 6 pink stripes. Join pink at end of Row 61. Row 62-66: Repeat Row 2. At end of Row 66, end off pink. Join white in any stitch. For sides: Work 1 sc in each rows ending in sc and 2 sc in each row with 2 dc. For corners work 4 sc in each corner st. Work 1 sc in each ch of starting ch for bottom and 1 sc in each st across top. Join with a sl st.
Feel free to share the pattern link with your friends or on your website or blog. Please do not copy and paste the pattern to your website or blog. You are free to sell the finished item, but not the pattern. If you liked this pattern, you may also like this.